“Private Viewing,”an exhibition of new work by sculptor Robert Lobe, will be on view at the West Broadway Gallery from January 12 to March 12, 2018. There will an opening reception on Friday, January 12 from 6-8 pm. For his first solo show at the gallery, Lobe will present a series of 10 new sculptures that continue his long-term investigation of the natural world. Deftly turning process into form, he has been hammering metal around rocks and trees in the woods for over 40 years, developing a kinesthetic realism of his own invention. Lobe has addressed environmental issues in his work since the 1970s, from the coast of Nova Scotia to the Adirondacks, to the Appalachians, and to to the Berkshires. Lobe’s marriage with the forest also has roots in the Earth art of the seventies, while the artist long ago rejected that movement’s site-specific restrictions. Lobe’s recent sculptures are much like field reports from adventures of discovery in a forest lab doubling as studio, canvas and text. A short video will present the artist’s ongoing project, “Sandy” documenting his creative process with a majestic tree/outcropping toppled over during Super Storm Sandy in Northwest New Jersey along the Kittatinny Mountains. Among the works included in this exhibition are “Before the Snow”, a galvanized iron and stainless steel wall sculpture which unites the silence of late fall with the still of winter. “Buds”, a budding branch in the shape of ancient script holds fast a boulder in a gravity-less world. A formidable back-to-back landscape of a massive sinewy root winding its path among boulders, “Kittatinny Double Lie”, brings the lie of the land into dramatic contrast. 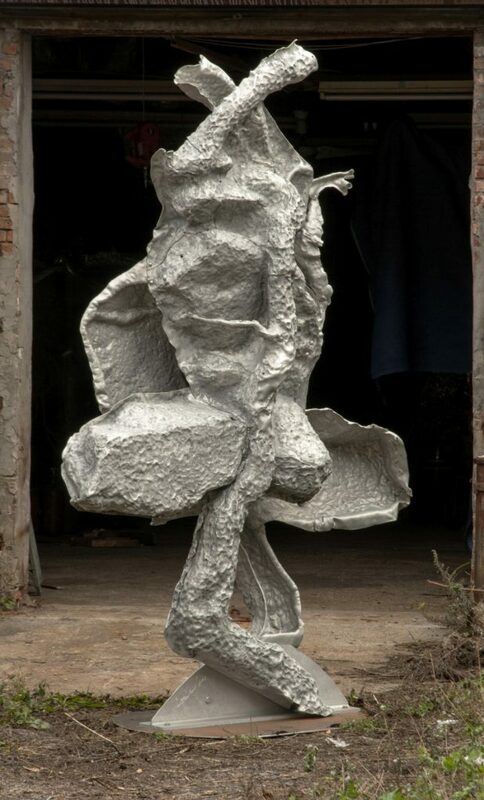 In “Vernissage”, “Gorget”, “Photosynthesis” and “Missing Rock National Monument,” Lobe utilizes a new casting method of throwing molten aluminum. Working with different metals, alloys and techniques, the artist turns a walk in the woods into a walk into the imagination. Accompanying the sculptures is a series of hammered drawings embedded with wafer thin castings of thrown aluminum, along with as a series of pen and ink drawings of the Statue of Liberty made just after 9/11.